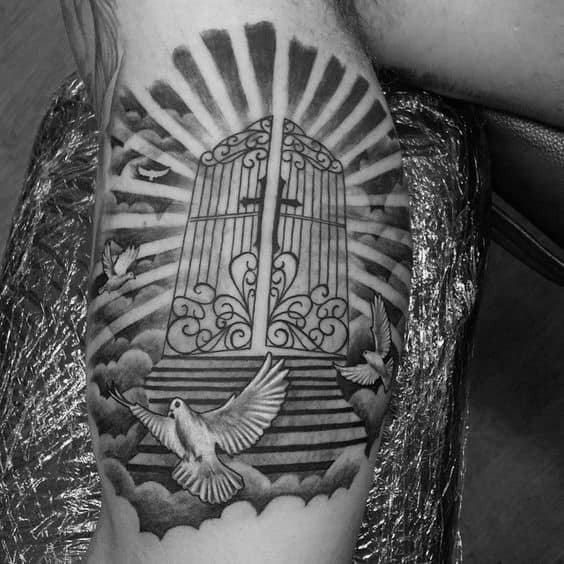 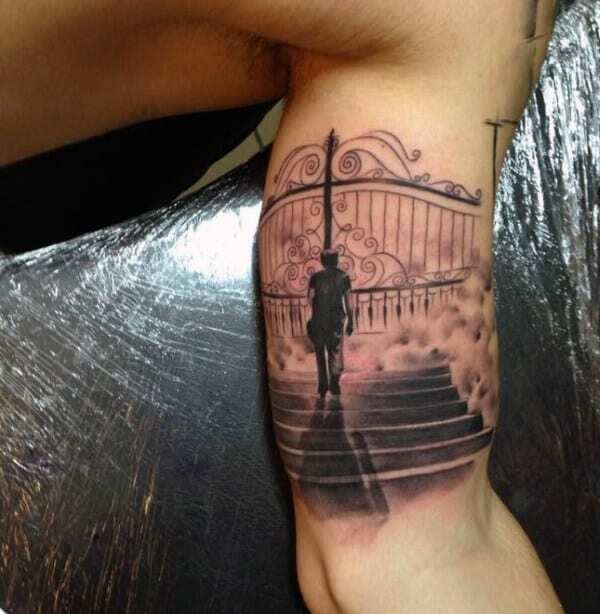 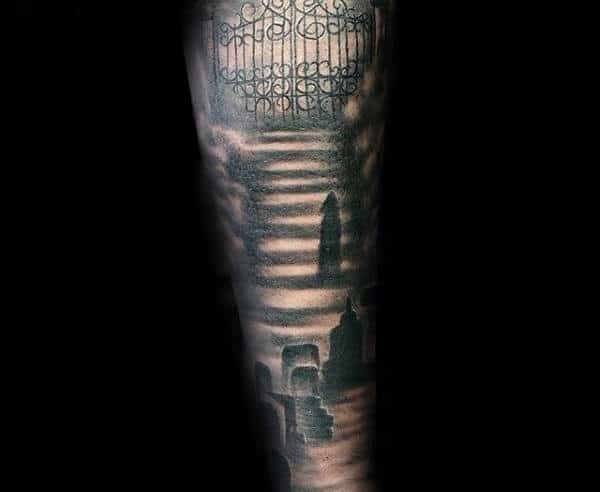 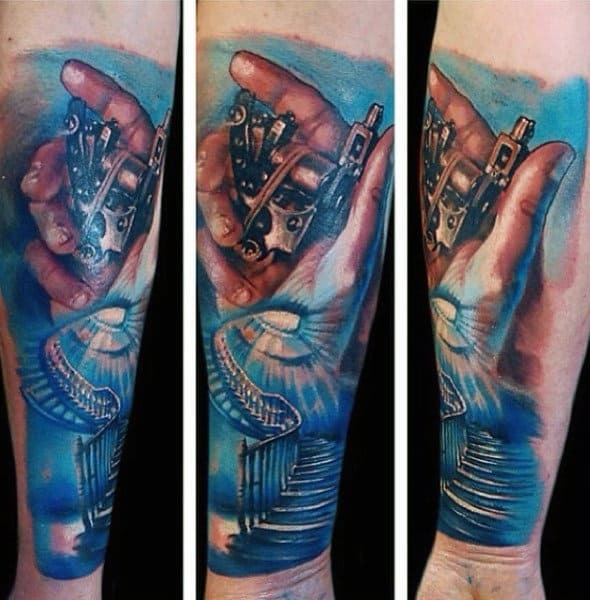 The best incarnation of religious body art has arrived in the form of heaven tattoos. 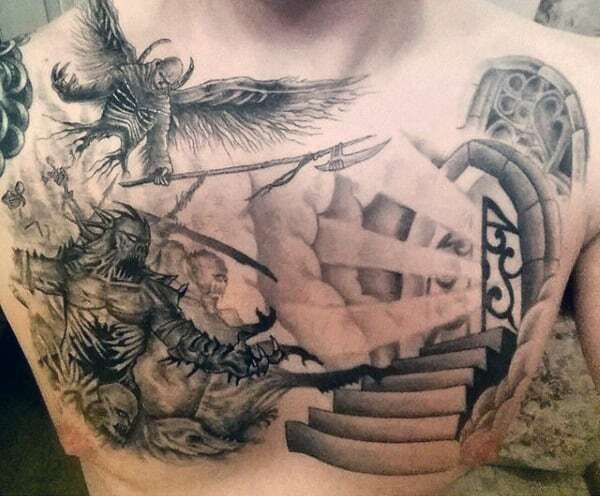 These touching pieces are deeply spiritual and majestically holy. 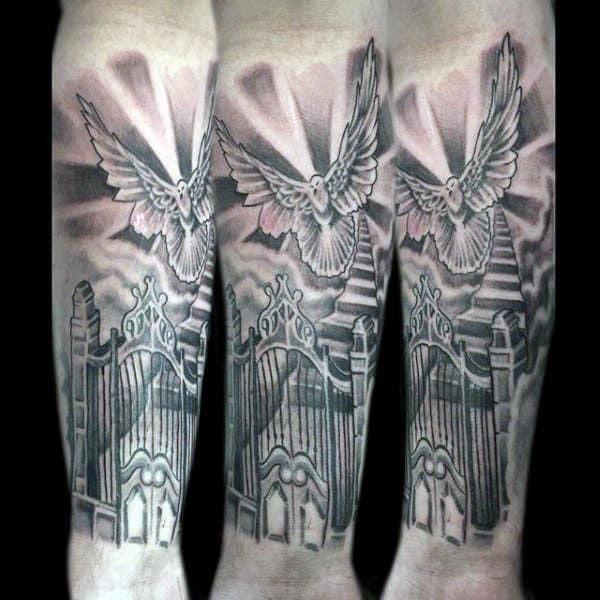 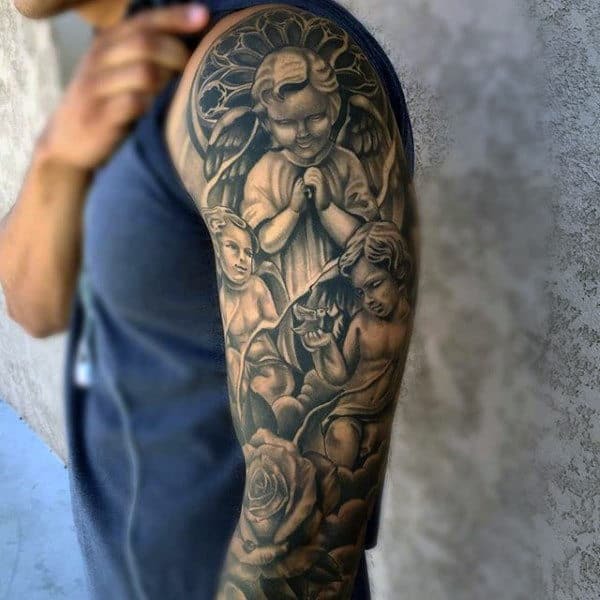 Heaven tattoos possess unparalleled divinity, and their chic Christian nature is guaranteed to convert onlookers while dazzling believers. 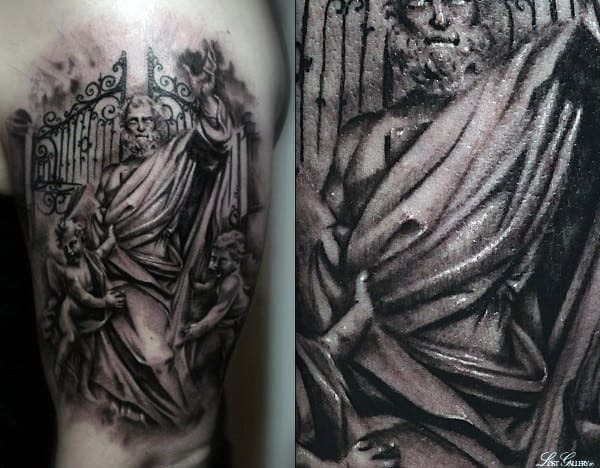 For a wholehearted expression of undying faith, this seraphic iconography is stirringly angelic. 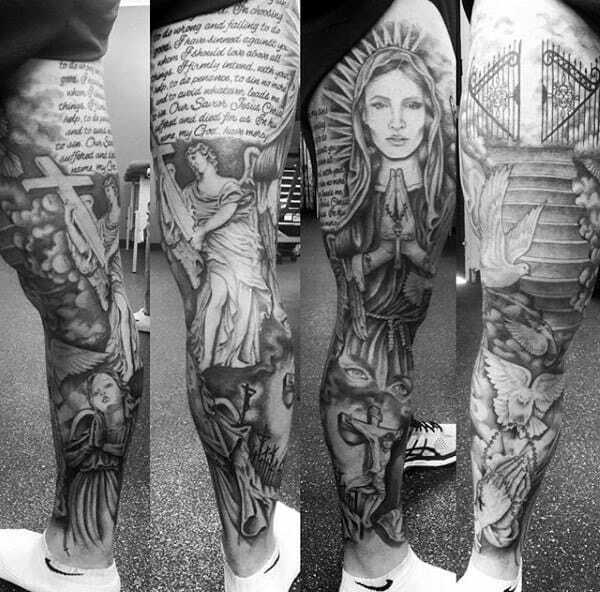 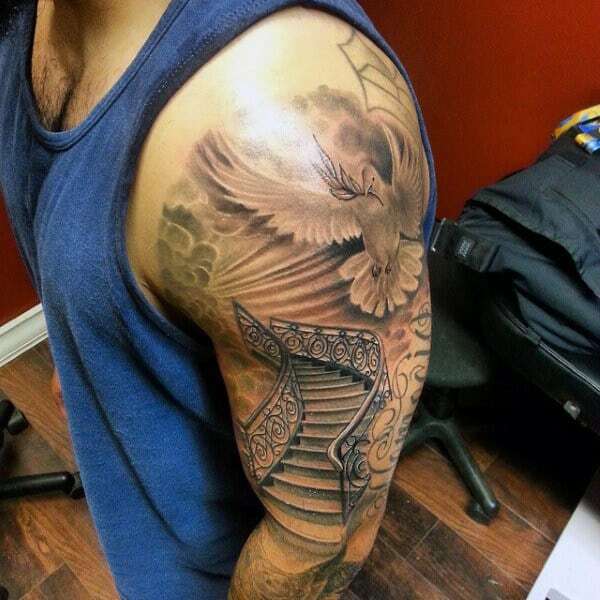 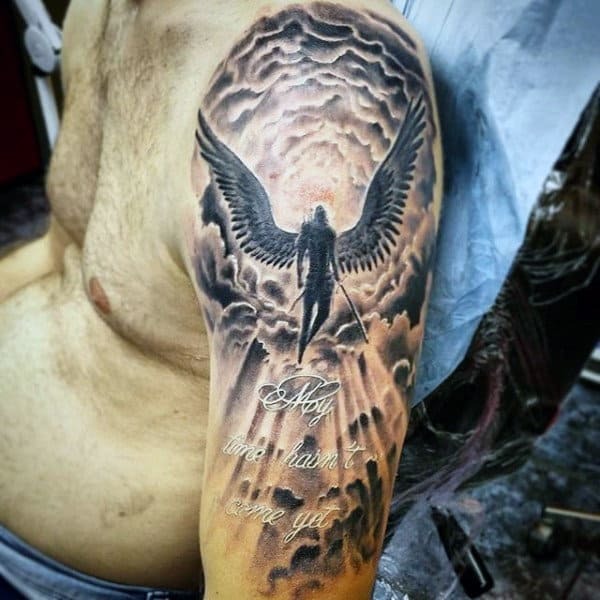 Speaking of angels, these celestial beings form the basis for some of today’s most moving heaven tattoos. 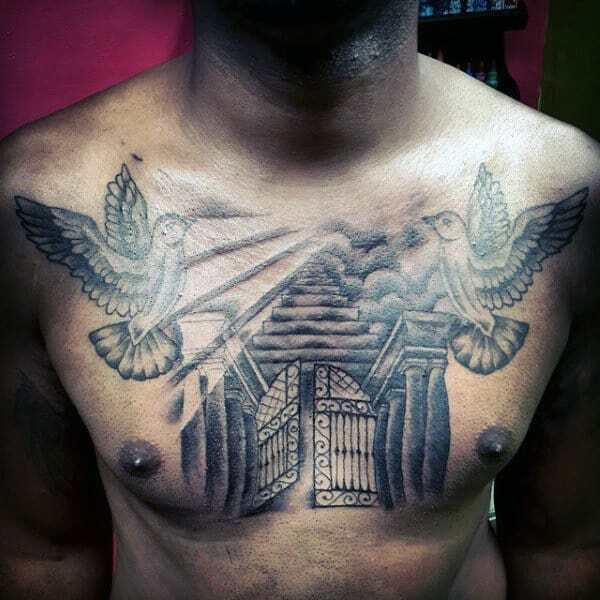 These pure vessels of light are virtuously marked with fluffy wings and golden halos. 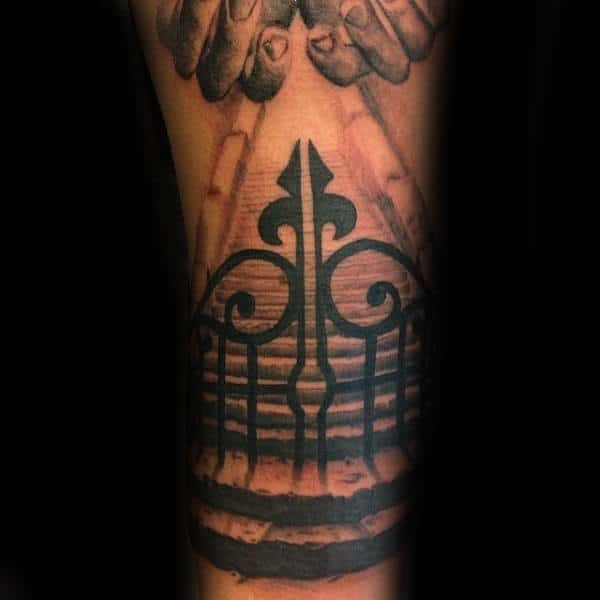 Specific saints are also regal choices. 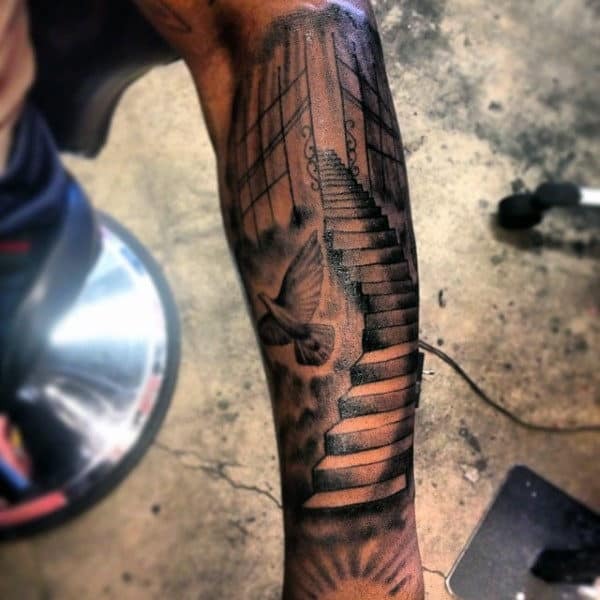 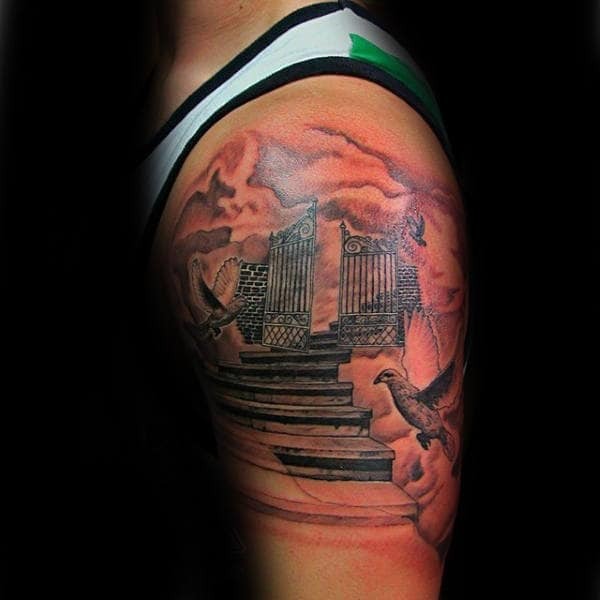 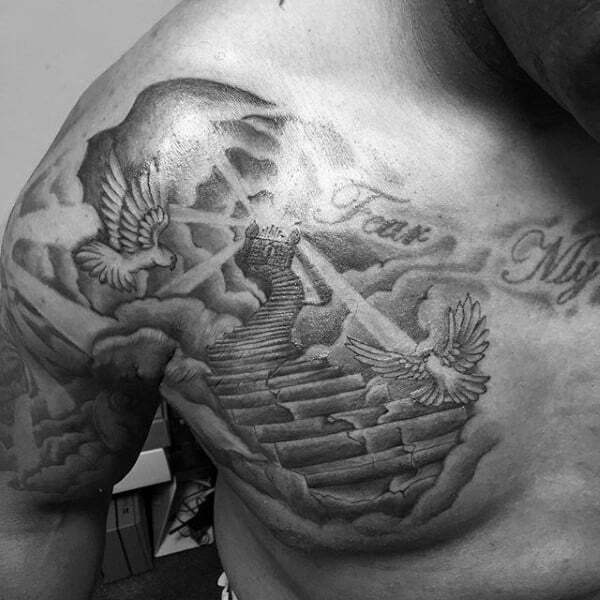 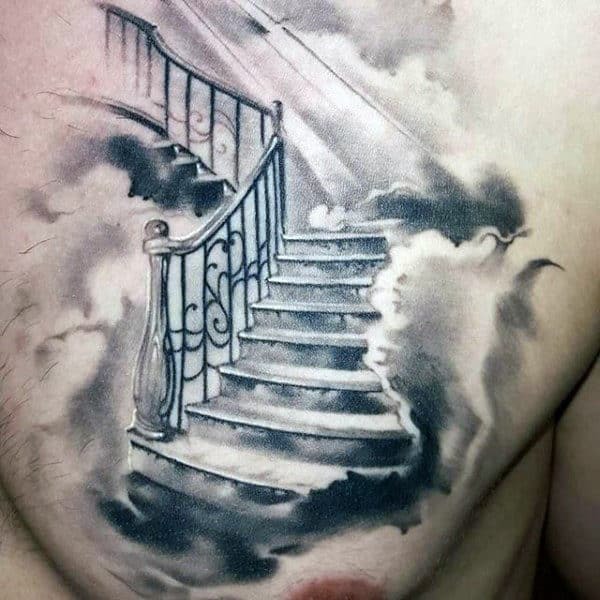 God is even known to make a cameo or two in certain heaven tattoos. 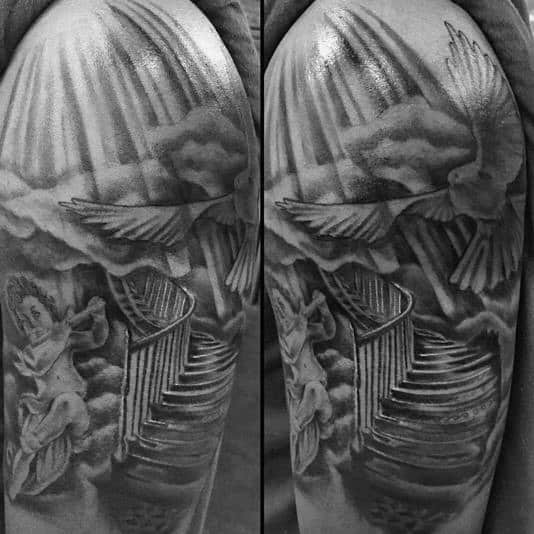 His hands are regularly depicted forming a warm embrace. 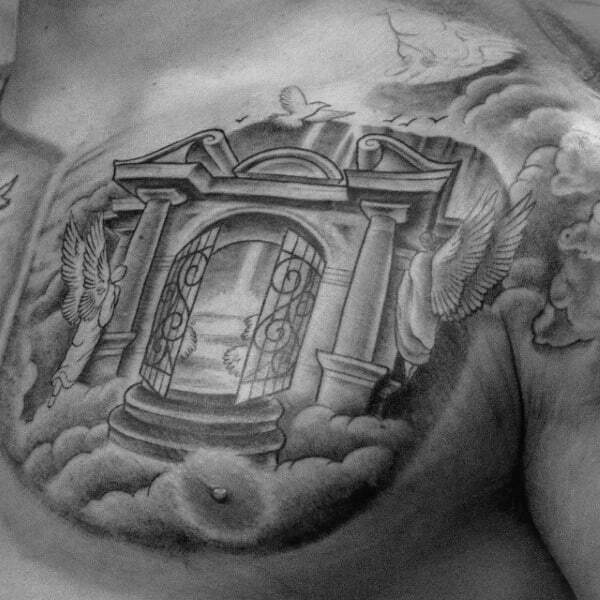 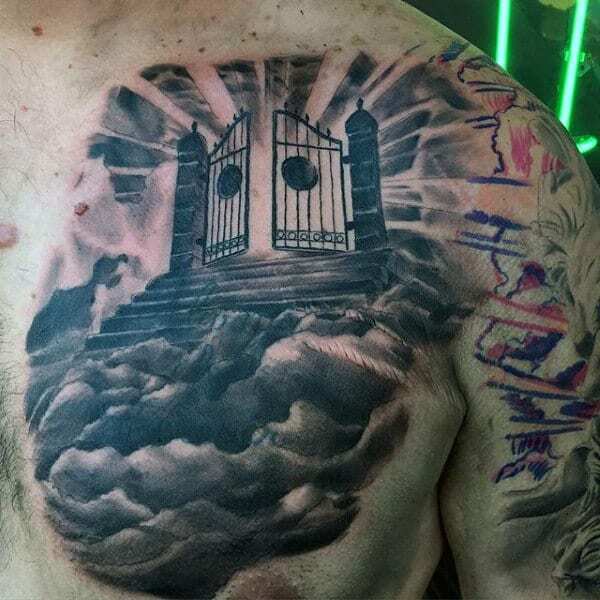 Other lofty emblems of the afterlife include staircases ascending through the clouds towards sparkling gates. 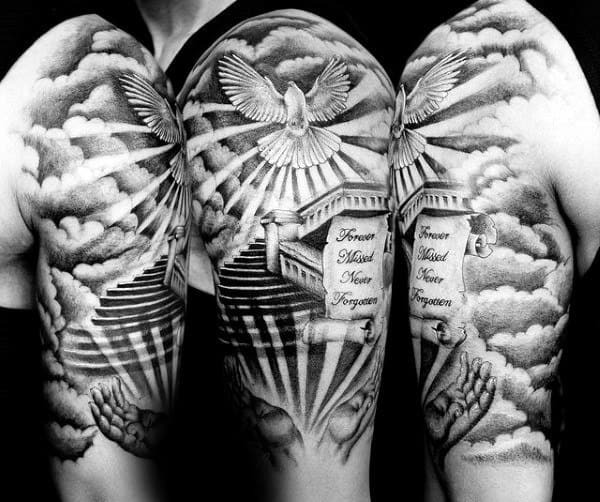 Biblical quotes can enhance the passionate significance even further. 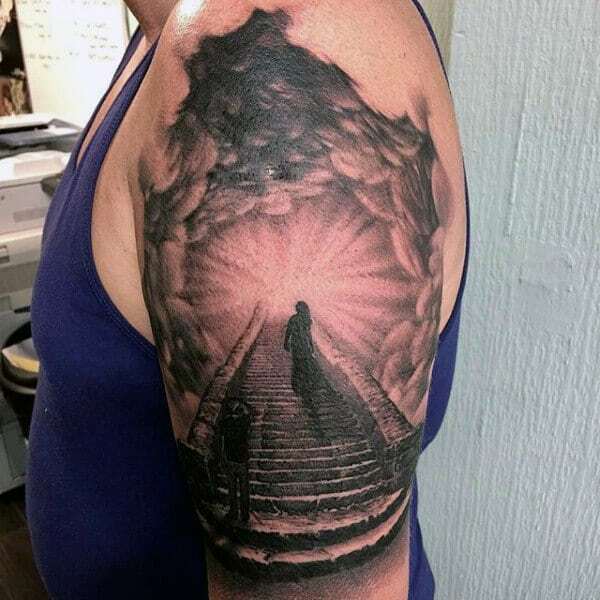 To personalize the heartfelt grandiloquence, lost loved ones can be featured in the midst of this atmospheric wonderland. 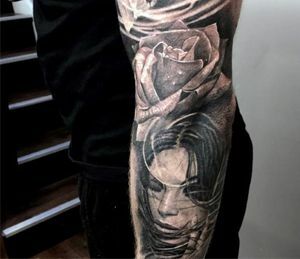 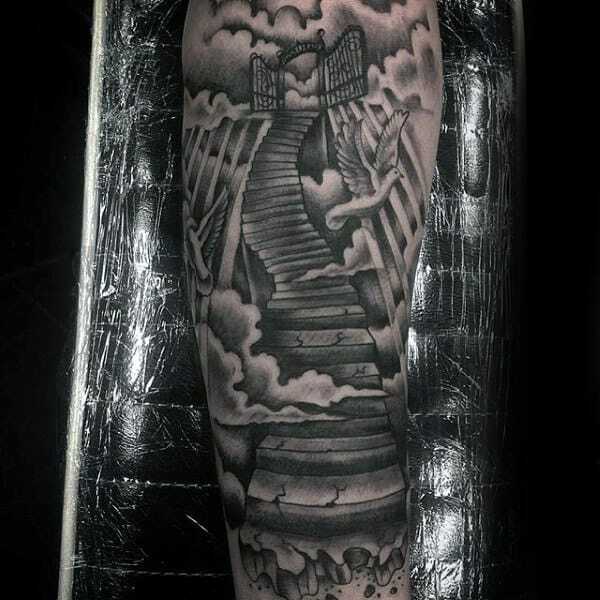 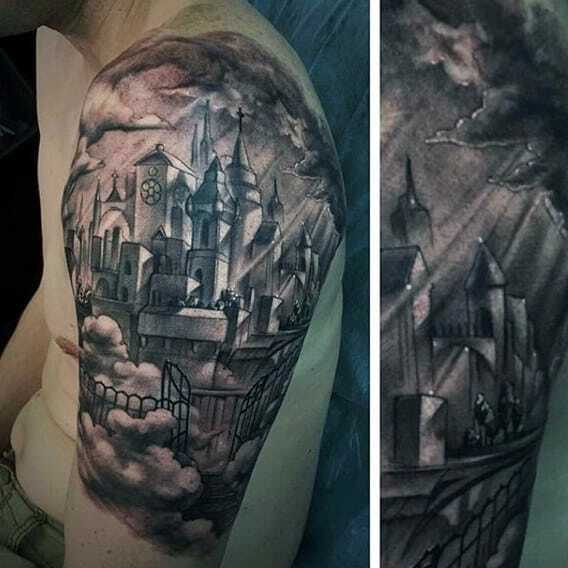 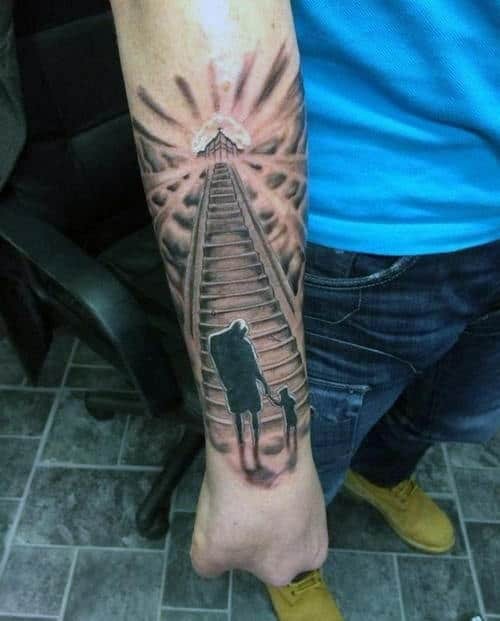 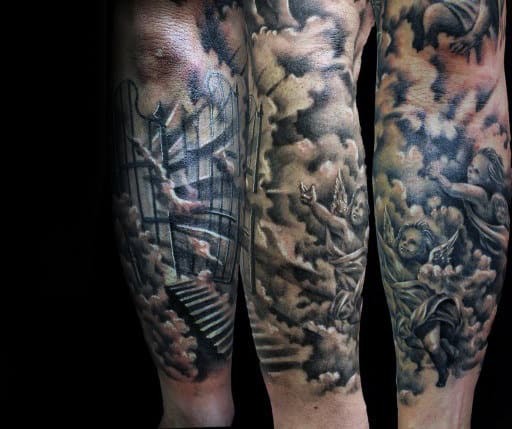 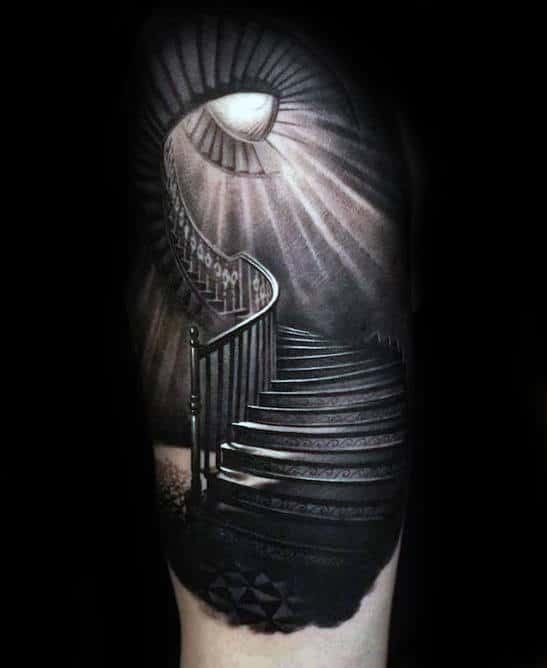 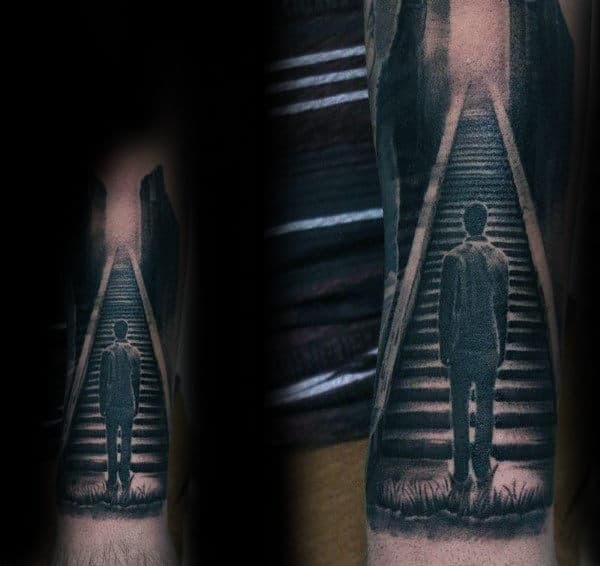 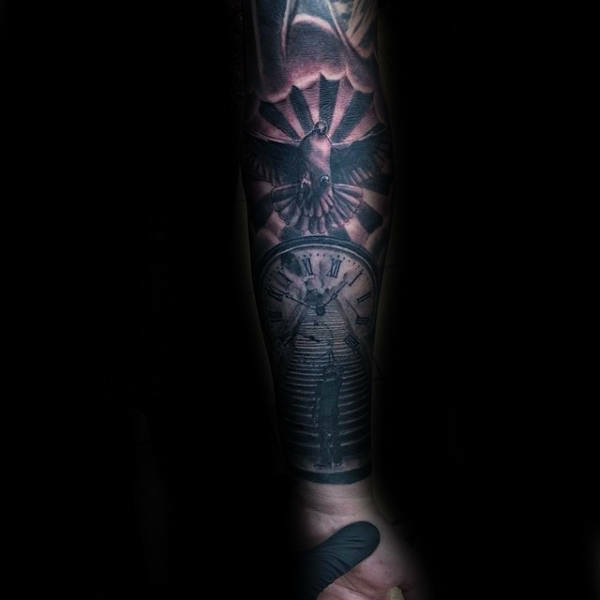 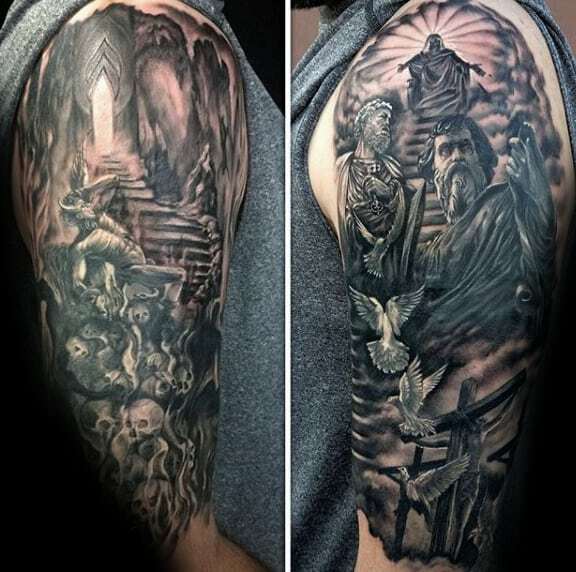 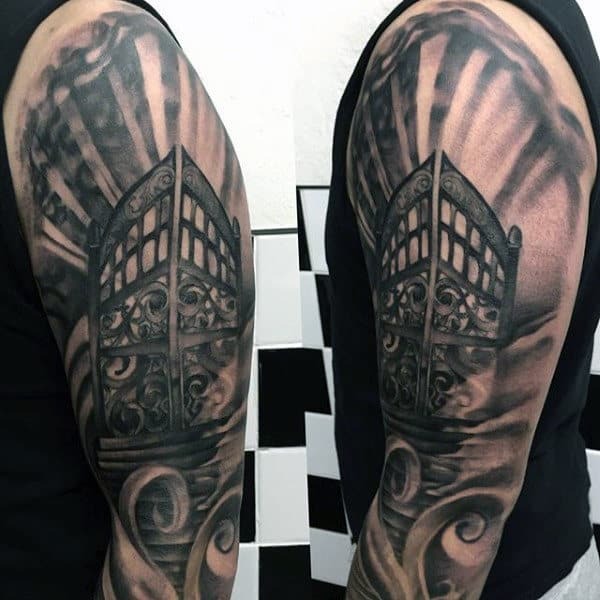 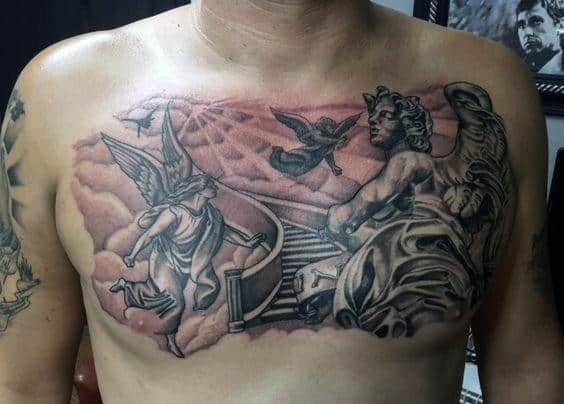 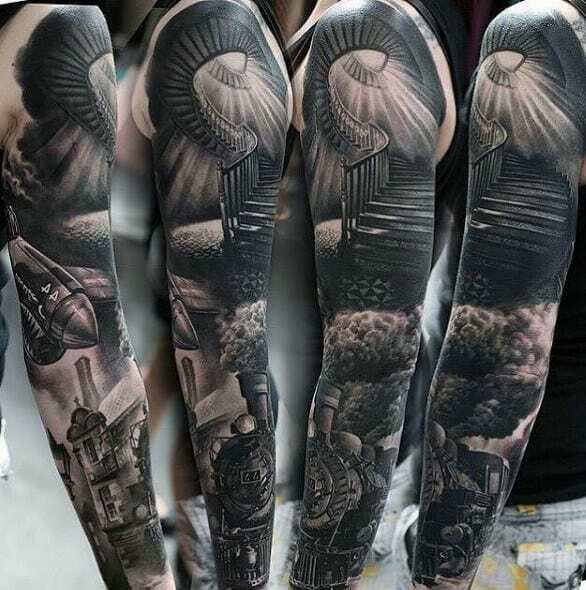 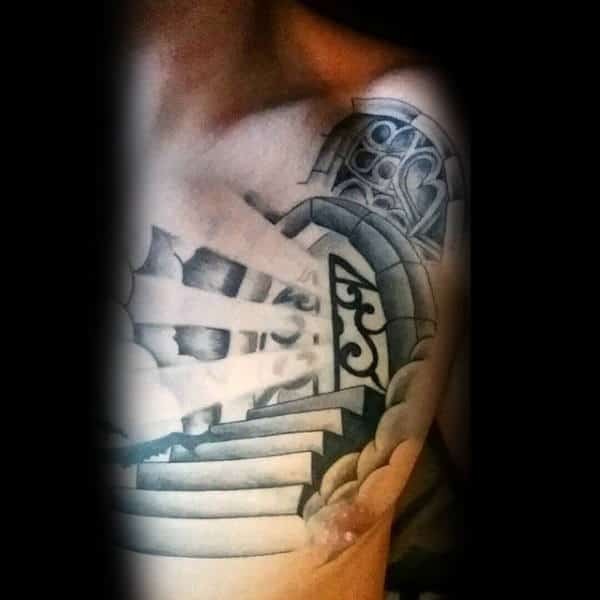 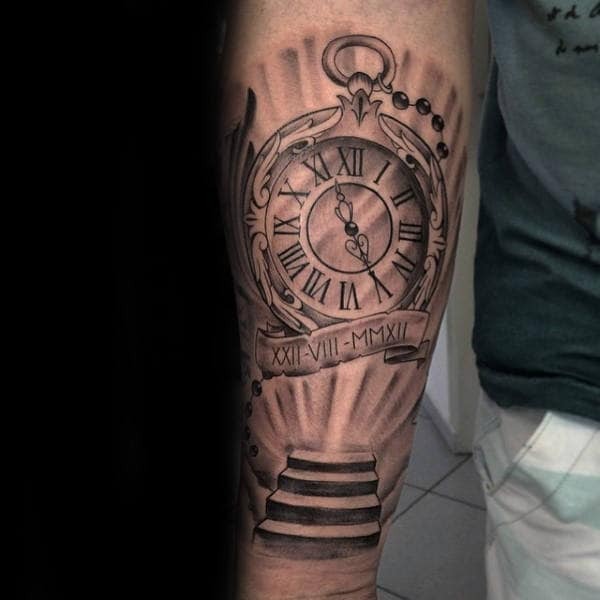 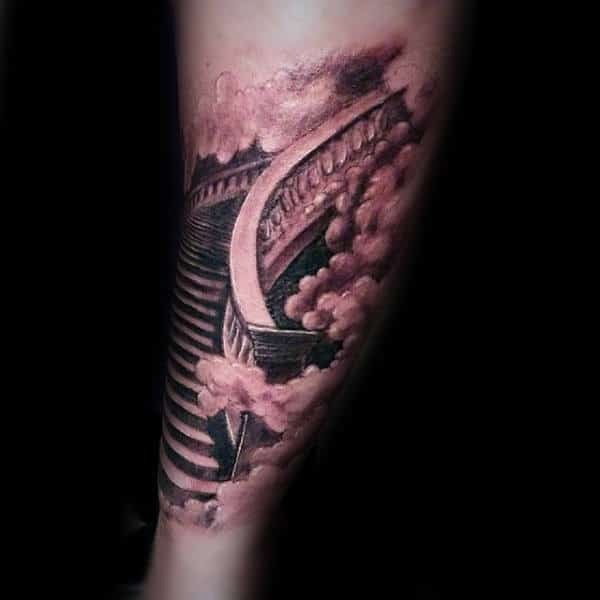 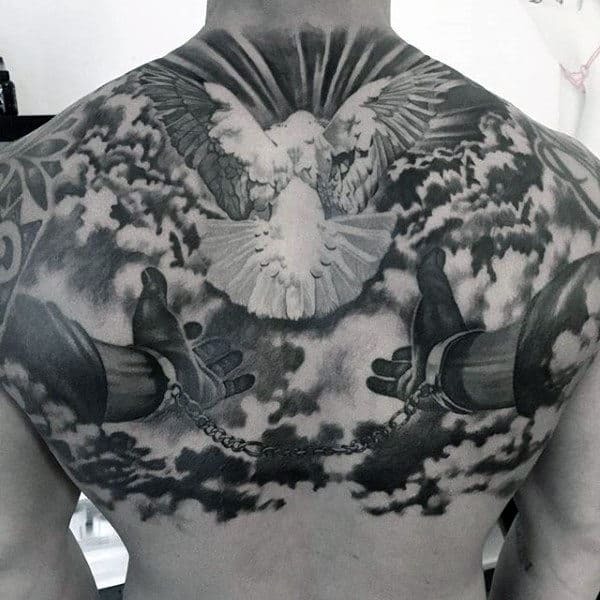 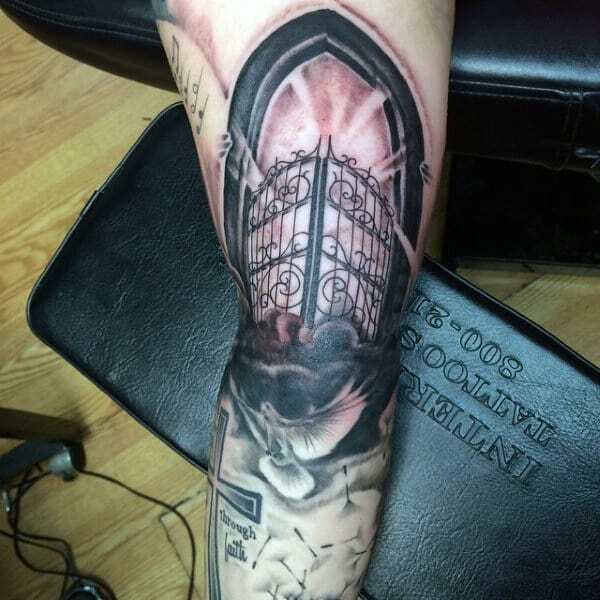 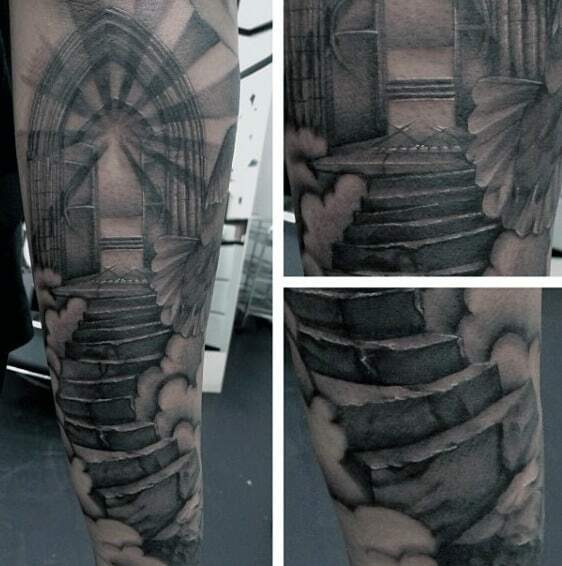 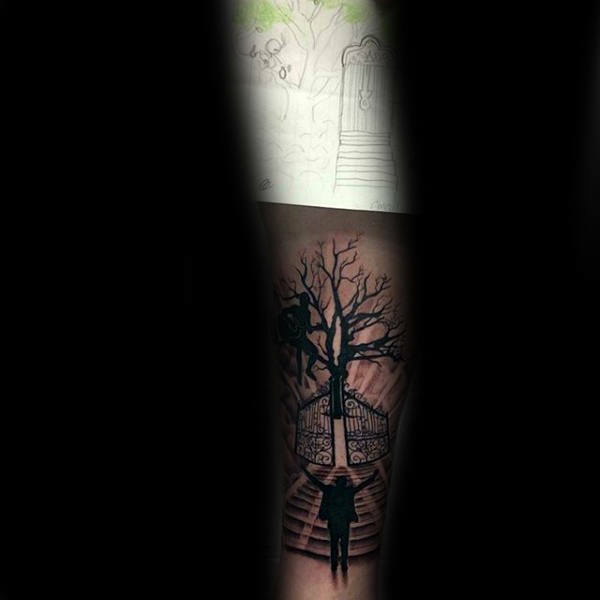 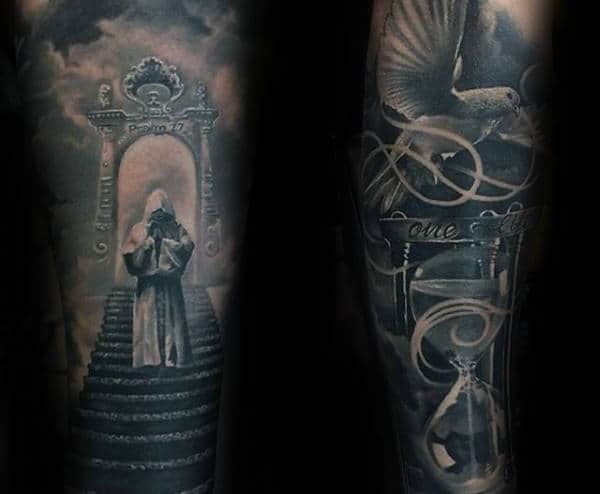 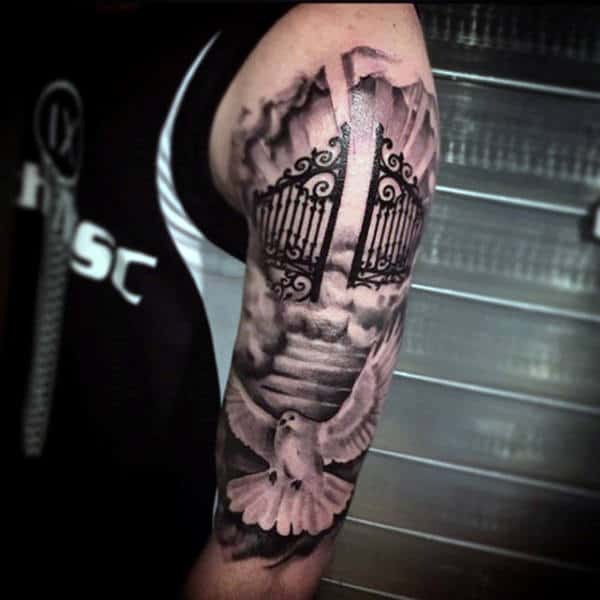 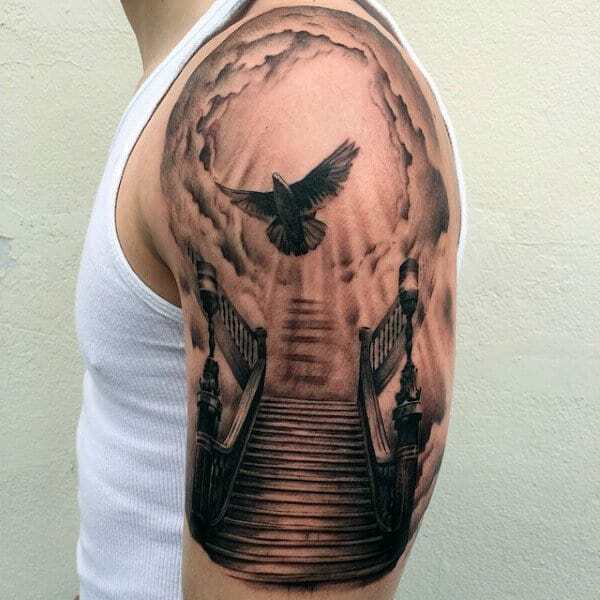 Some practitioners like to show both sides of this religious reality, so their heaven tattoos are frequently complemented by the hellish alternative. 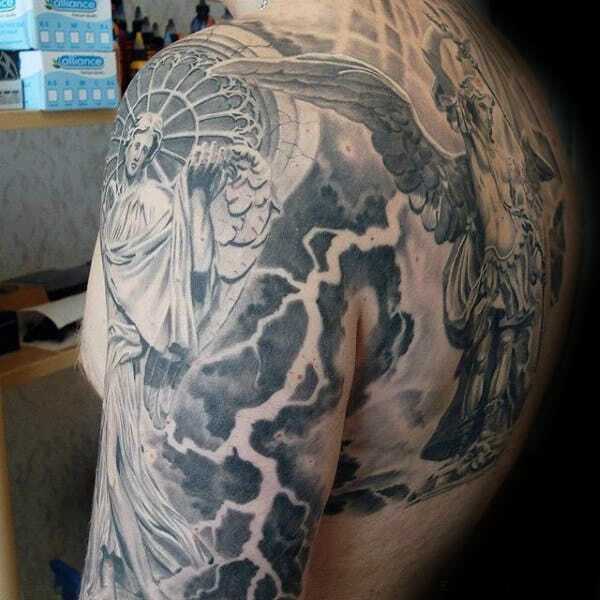 Using the devil as a counterpart is a rousing way to magnify the magical paradise of Zion. 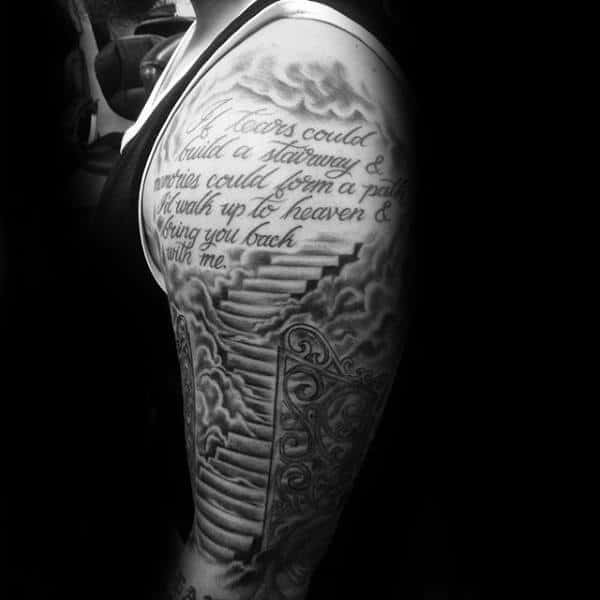 Enjoy this look at inked nirvana for some blissful encouragement!